Xiaomi, a Chinese electronics and smartphone maker has officially announced an automatic foldable umbrella. This Umbrella is designed with a coat that protects the umbrella from rains. 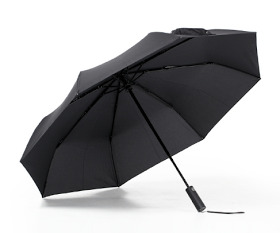 This umbrella is said to be used during the rainy season and even in sunny conditions. This umbrella uses a nylon material that keeps the rain at bay and there is a second coat on top which protects from ultraviolet rays. One main feature about this umbrella is that, it folds itself automatically, i.e, it opens and closes by itself automatically without you manually doing it. About the price and the launch date, the automatic foldable umbrella will be priced at $15 (about N6,000 in Naira). Sales begins 24th of July 2017.
this is a good news to hear from xiaomi. Nawa o. These people ko even wan make we dey to anything again. Everything Is going smart.